The Large Bone Calipers are sliding anthropometric calipers used to measure a straight-line distance between two landmarks. 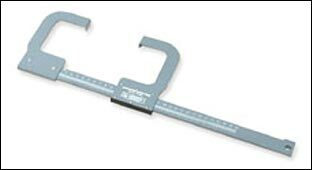 The Large Bone Caliper has a range of 0 to 60 cm in 0.1 cm increments (with an accuracy of 0.5mm). Popular uses include measuring shoulder width, long bone length and chest depth for tracking growth, and development of children or for use in motion analysis studies. The sliding C-shaped arm to provides accurate and precise measurements. The Small Bone Calipers are sliding anthropometric calipers used to measure a straight-line distance between two landmarks. Our Small Bone Caliper has a range of 0 to 30 cm in 0.1 cm increments (with an accuracy of 0.5mm). Popular uses include measuring wrist, elbow, knee, and ankle widths, as well as measuring smaller muscle masses like the bicep and calf. The sliding C-shaped arm provides accurate and precise measurements.